iPhone 4S digitiser, this is the part you require if you have damaged the front glass on your white iPhone 4 and it has cracked, or if the touchscreen is not responding to any input. Please be aware the complete screen units are bonded, however if you have a separate LCD this can easily be installed. 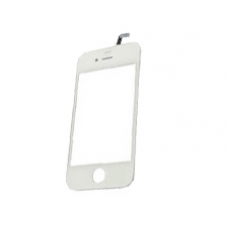 We also stock optically clear adhesive film sheets allowing you to mount the glass lens to the iPhone 4S LCD screen assembly. Order iPhone 4S OCA Screen Mounts.